A federal judge in Galveston is to consider motions in a lawsuit filed by a Washington-based voters’ rights group that contends Texas laws make it illegally difficult to register voters. That hearing was scheduled for yesterday. Here’s a story from the hearing. Volunteer voter registrars are fearful of new laws that impose criminal penalties for improperly filling out voter registration forms or turning them in late, a Galveston County deputy registrar testified Monday. “You’re afraid that if you made a mistake there was an implied prosecution,” testified Estelle Holmes of Hitchcock, a volunteer deputy registrar for more than 30 years. 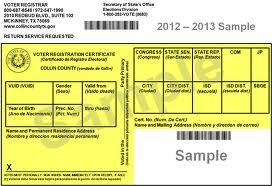 The penalties enacted by the 2011 Legislature are being challenged by Voting for America, a nonprofit organization dedicated to registering minority and low-income voters nationwide, and two Galveston County residents in a lawsuit against Texas Secretary of State Hope Andrade and Galveston County Tax Assessor-Collector Cheryl Johnson. The lawsuit asks U.S. District Judge Gregg Costa to declare that Texas voter registration laws violate the 1993 National Voter Registration Act, improperly prevent inspection of voter registration applications and violate the organization’s constitutional speech rights. Voting for America, an affiliate of Project Vote, argues that Texas laws make conducting large-scale voter registration drives impossible. Texas improperly restricts public access to inspect and copy voter registration records in violation of the NVRA, thus severely hindering the ability of individuals and organizations to verify the accuracy of the voter rolls and the fairness of the voter application process. Texas improperly regulates the distribution of voter registration applications, as it requires anyone seeking to do so to first be appointed as a “voluntary deputy registrar (VDR)” by a county registrar, and places unfair and onerous restrictions and requirements on such VDRs. For example, VDRs must be registered to vote in the state of Texas, and may only accept registration applications from applicants who reside within the same county in which the VDR was appointed. Texas prohibits VDRs from mailing in completed applications. Rather, VDRs must personally deliver completed applications within five days of collection, a requirement that severely hinders the ability of large-scale voter registration drives to manage their programs and implement effective quality control measures. Texas places undue restrictions on how community organizations manage their employees, making it virtually impossible to fire under-producing employees and threatening organizations with such excessive threats of fines and criminal prosecution that running such a drive would be prohibitively risky in the state. Michael Li has a copy of the lawsuit here. All of these objectionable provisions were passed by the Legislature last year, with the express intent of making it harder to register voters. I can’t think of any good reason why registration applications can’t be mailed but must be dropped off in person, or why someone from Harris County could not register someone from Fort Bend or vice versa. Amid all the fuss over voter ID and redistricting, these changes went mostly unnoticed. I’m glad to see that someone filed a suit to stop these petty nuisance laws, and I will try to keep a closer eye on its progress. I found that story as a related link to this story about the upcoming voter ID trial. There’s not really anything I’d call “news” in it, but I suppose even that is worth noting. Despite legal maneuvering by Texas and Justice Department lawyers, a three-judge U.S. District Court panel has cleared the docket for a July 9 trial. And it remains questionable whether the new law can be implemented in Texas by the November general election. Texas joins South Carolina as states that have filed lawsuits challenging the Justice Department’s rejection of voter ID laws. The states claim that the Obama administration is overreaching in its opposition to voter ID laws, which have been found to be constitutional by the U.S. Supreme Court. “Texas should not be treated differently and must have the same authority as other states to protect the integrity of our elections,” Texas Attorney General Greg Abbott said. Minority-rights groups have sided with the Justice Department, saying the Texas law, which requires a valid photo ID, is aimed at suppressing voting by African Americans, Hispanics and other minorities. Holder said a similar law in South Carolina was blocked by the Justice Department because it would have placed an unfair burden on nonwhite voters. In both cases, the Justice Department blocked the laws by not granting a clearance under Section 5 of the Voting Rights Act, which requires states, most of them in the South, with a historical pattern of discrimination to “preclear” changes in voting laws or political lines. “The past two years have brought nearly two dozen new state laws and executive orders, from more than a dozen states, that could make it significantly harder for eligible voters to cast ballots in 2012,” Holder said. Texas, like several states, is challenging the Justice Department’s authority to deny preclearance. Like I said, nothing really new. I am glad I clicked on it, however, as I wouldn’t have found the real story otherwise.